For small projects, like a new screen, the manager probably has memorized steps that lead to successful implementations. A screen should only take a few days, so there is not much to optimize. However, when there are many screens, or many steps, in a project, the critical path method becomes very useful. The building of the list of tasks and the building of the charts force the manager towards realistic estimates and solutions. Makes a list all of the steps that seem required. The list becomes the basis for calculations. When two tasks depend on two or more of the same parent tasks, the chart becomes messy. This chart has only two programs; a dozen would be very messy. To unsnarl some of the mess, connectors come into the picture, and the number of pages or frames increases. Sometimes, the definition of the parent is flawed. The chart on the right decomposes several ways. 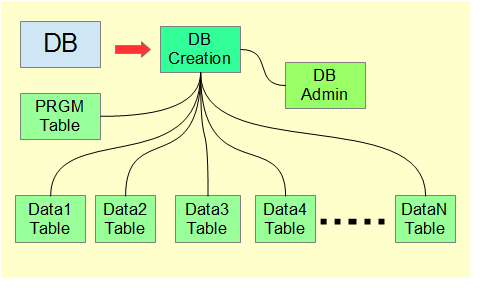 The DB box represents a data base; likely there are multiple tables. Likewise the data might go into the DB thru a load process or into the programs via a keyboard. In some cases, shorthand simplifies the chart. If the Menu mechanism already exists, the Menu becomes a candidate for shorthand. The DB box probably has many embedded boxes or tasks. Extracting the boxes gives more detail and hopefully better estimates. The DB Creation and the DB admin probably becomes a box at the beginning of the project. The PRGM table probably needs a record for each program, which might be a short task. 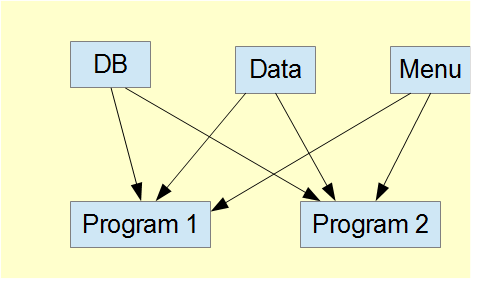 Later, a general DB box and a few data tables become prerequisites to each program. The Menu Box usually has a simpler decomposition.